As a company that specializes in CAD Translation, we often get questions about a wide range of CAD file extensions; to make this easier on our customers, we’ve compiled a list of the most common Brep and Visrep formats. Brep stands for Boundary Representation, which is a true CAD format. Visrep stands for Visual Representation, which is a polygonal or tesellated format. We are including both Brep and Visrep formats in this listing since there is often confusion as to which is which. Find out more about Brep vs Visrep here. .PDF Visrep 3D PDF is a great format for sharing geometry with those who do not have access to CAD systems or CAD viewers; all that’s required is the Adobe Reader, which is already on almost all PCs. .3DXML Visrep 3D XML is a visualization format developed by Dassault Systemes. .3DS, .MAX Visrep .3DS files contain mesh or nurbs information; .MAX files contain all scene information, including mesh data. .SAT, .ASAT, .SAB, .ASAB Brep ACIS is a geometric modeling kernel used in many CAD applications. .SAT and .SAB files are part files, .ASAT and .ASAB files are assembly files. Files that end with B are binary. .DWG, .DXF Brep and Visrep .DWG files are binary, .DXF files are ASCII. Both formats can contain both Brep and Visrep geometry. .FBX Visrep Primarily used for exporting mesh, material and animation data to game engines. .PRT, .CKD Brep CADKEY is now known as KeyCreator. .MODEL Brep .MODEL files can represent both parts and assemblies. .CATPart & .CATProduct Brep File format is similar to V5 files. .DRW, .PRT, .ASM Brep .DRW are drawing files, .PRT are part files, and .ASM files are assembly files. Creo was formerly known as Pro/Engineer. .F3Z, .F3D, .CAM360 Brep .F3Z files are archive files, .F3D are part files, and .CAM360 are toolpath archive files. .CMP, .GCD Brep .CMP files are component files, .GCD are drawing files. .IGS, .IGES Brep IGES files are predominately surface files, though the definition does allow for solid models. Read more about IGES, learn why to avoid IGES, and alternatives to IGES. .IPT, .IAM Brep .IPT files are part files, .IAM files are assembly files. .JT Both JT, created by Siemens / NX, is unusual in that it can contain both Brep and Visrep content. JT is also compressed about 8:1, so it is a good visualization format for large assemblies. .CKD, CDL Brep KeyCreator was formerly CADKey; .CKD files are for parts and assemblies, .CDL files are for Wireframe Design files. .NWC, .NWD, .NWF .NWC files are cache files, .NWD are documents, .NWF are file sets. .PRT Brep NX was formerly Unigraphics; one confusing aspect to NX .PRT files is that the same extension is used for both parts and assemblies. .X_T, .X_B Brep Parasolid is the geometric modeling kernel used for SOLIDWORKS, Solid Edge, and many other CAD solutions; read more about Parasolid here. .G Brep Granite is the geometric modeling kernel behind all Pro/E and Creo products. .3DM Brep Rhino is primarily a freeform NURBS surface modeler specializing in complex surface creation. .PRT, .ASM Brep SDRC was purchased by EDS in 2001, and then by Siemens in 2007, and is no longer in existence as a CAD solution. Since version 11, I-DEAS was able to export parts and assemblies as Parasolid files to provide interoperability with NX. .SMS, .IWB, IWP Brep SMlib is created by Solid Modeling Solutions; these files are geometric modeling kernels used in a range of CAD applications. .PAR, .ASM, .PSM Brep .PAR files are part files, .ASM files are assembly files. Solid Edge is made by Siemens. .SLDPRT, .SLDASM Brep .SLDPRT files are parts, .SLDASM files are assemblies. SOLIDWORKS is owned by Dassault. .STEP, .STP Brep STEP is the most popular neutral CAD format in the world today. .STL Visrep .STL files are widely used for 3D printing. .PRT Brep Unigraphics is now known as NX; one confusing aspect to Unigraphics and NX .PRT files is that the same extension is used for both parts and assemblies. .OBJ Visrep .OBJ is widely used by modeling and animation solutions such as Maya and 3DS Max for transfering polygonal meshes. .ZBR, .ZPR Visrep ZBrush is a modeling and texturing application. .Z3 Brep ZW3D is made by ZWSoft. .WRL Visrep VRML stands for Virtual Reality Modeling Language. .HTML Visrep WebGL stands for Web Graphics Library. This format allows viewing and rotating in any HTML5-compliant browser with no plugins needed, and is suitable for online parts libraries. Many of these files can be read and written by TransMagic products; to see which ones, check out our CAD Formats page. Want to give TransMagic a try? Click here to try the free 7-day eval of TransMagic. Brep vs Visrep Models – A comparison between Brep and Visrep models which looks at pros and cons of each. The CAD Format Ladder Part 1 – A system to determine the best format for each situation. The CAD Format Ladder Part 2 – Part 2, determining the best format for each situation. What Format Do I Have Here? 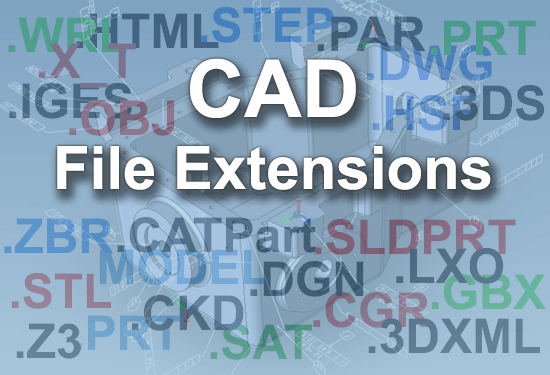 – Using the contents of the CAD file to determine the format and version.